Blessings Unheralded is the Free RPG Day Wrath & Glory adventure. If you've got a Free RPG Day paper copy, great. If not, there's a link floating around out there to get it free for July ONLY. Then, whilst still cheap, it will cost you moneys. This means that reviewing it is like reviewing Whisper Base for Age of Rebellion, or Broken Chains for Black Crusade; you're almost inevitably missing some of the detail, but have enough to get a decent overview of the game. Gael Harden, a Cadian Guardsman. It's a bit of a super-friends brigade, but the backstory is that they're essentially the 'inner circle' of a Rogue Trader's allies and advisors; this is post Gathering Storm, where the Great Rift has basically buggered half the galaxy and a Peer Of The Imperium's warband is likely to consist of 'whatever loyal individuals I can lay my hands on'. The game looks nice. At first glance it appears to fall somewhere between the Dark Heresy/Only War series and the Star Wars/Genesys series in 'crunchiness' of rules. The game uses 'normal' 6 sided dice. Because it mostly only uses 4 faces of the dice and talks about 'icon' and 'exalted icon', expect custom dice to pop up as merchandise sooner or later, but unlike the star wars or legends of the five rings stuff you don't actually need the custom dice. Your stats + skills + circumstantial bonuses give you a number of dice to roll. The maximum number of bonus dice is limited by your character's tier (level) - to 6 in the case of this adventure. A 4 or 5 is an 'icon' (1 success), a 6 is an 'exalted icon' (2 successes or another bonus effect). 1 die nominated before the roll ('the red one') is the wrath die. This includes genysis-style opportunity and threat - on a 6 you get a point of glory, on a 1 you get a complication ('I hit but my gun is jammed'). It still generates icons normally, too. Difficulty is a flat target number (default 3), with situational increases or decreases. Multi-Attack, for example, lets you shoot at several targets with a penalty to your 'to hit' roll. Success is beating the target number. Bonus successes don't seem to do too much (except in the case of combat) but bonus '6's (exalted icons) specifically do matter, a lot. Since 'more than normal success' is probably going to require you to roll a '6' that you don't need to pass the test in the first place, 'critical success' on a check is not easy at all - you're really going to notice the difference between skilled and unskilled characters getting the option for these 'extra boosts'. By comparison, there doesn't appear to be an 'unskilled penalty'. So it's more like Genesys that anyone has a reasonable chance of a basic success (good if the medic's the one who's bleeding out!) but without a big dice pool getting those bonus effects is nigh impossible. Wrath - a personal resource, players get 2 each per session in the starter adventure and can pick them up for completing personal objectives. Everyone gets a D6 table of personal objectives. For example, if Victoria Lin summarily executes someone in a way that the GM agrees meaningfully serves the Imperium. Starts at 0 each time, built up from 'spare' 6s on checks and or '6's on the 'wrath' die. Both can be spent to boost rolls, but their effects are different, meaning that for that roll that absolutely positively has to go your way, they can be stacked if both are available. Ruin - yes, I said there were 2. Ruin is the GM's equivalent, and has broadly similar effects, but represents fate-points-for-the-bad-guys. The GM can pick it up as a complication, and some Master/Nemesis/Whatever NPCs have their own personal stockpile. Interestingly (but logically!) Weapon Skill and Ballistic Skill are both....skills. Ballistic Skill works off Agility and Weapon Skill works off Initiative (not strength, which is one thing which helps keep the Space Marine in check). There is a default 'how hard you are to hit' stat, Defence. There is a separate stat, Resilience which is 'when hit, how hard you are to hurt'. In practice, this is probably generated from toughness. The character sheets show resilience as two numbers - from the context presumably 'armoured' and 'unarmoured'. Wealth and Influence exist as two separate stats. They're single-digit stats implying you make a wealth or influence check, but neither is really used in the starter adventure. Much like 8th edition 40k, everyone has a bundle of default keywords ('Imperium', 'Chaos', 'Adeptus Ministorum' etc). The GM is encouraged to provide bonus dice where an intereactee would likely also have said keyword, but some rules namecheck them specifically. Pater Nemoris' hatred talent gives him +1 on melee attacks 'vs. beings with the Heretic keyword'. Sister Orten is noted in her background section as having fought to protect some astropaths from generic cultist loons. Noticably, along with the Imperium, Adeptus Ministorium, Adepta Sororitas and Order of the Sanctified Shield keywords you might expect, this results in her also having the Adeptus Telepathica Astra keyword, which you wouldn't. Consider it a list of 'peer' talents. Initiative in the starter adventure is very simple - there are no rolls; the PC's pick someone to go first then alternate with the bad guys unless someone spends wrath/ruin to 'seize the initiative' and add an extra good/bad guy turn before the I-go-you-go resumes, or unless someone ambushes the other, in which case ambushers go first in the first round. Mobs are swarms of disposable goons. They're still a touch more dangerous than horde magnitude - more akin to Genesys minion groups or Legend of the five rings minion groups - essentially a bunch of individuals where all but one spend their action 'aiding' the first one, who actually attacks, and who don't impose a penalty for multi-attacking the group. Since aiding adds bonus dice, mobs will be good at hitting (as 1/2 the dice will add one or more icons) but won't cause ridiculous horde damage (as only 1/6 of the dice can shift dice to damage rolls, and even then only if they've hit 'already'). This means that fighting a mob is easier with armour and toughness than flashy swordsmanship and agility. There is no 'location roll' when shooting someone. You hit them or they don't, and armour has added an average value across the whole body. There is a separate damage roll (unlike Genesys) but it's more obviously coupled to the to hit roll than Dark Heresy because you can 'shunt' bonus dice from your to hit roll to your damage roll. Because damage dice add 0, 1 or 2 damage, far more of the damage potential of a weapon is in the 'flat' damage bonus. A Lasgun (damage 7 + 1 die) does 7 damage 1/2 the time, 8 damage 1/3 of the time, and 9 damage 1/6 of the time (before extra bonus dice). However, 9 damage is less than the armoured resilience of the battle sister, which means that the two power armoured characters can only be hurt by lasfire with a spare '6' on the damage roll (a lucky shot) a called shot to a weak point, or some other form of damage boost. If you equal the target's resilience, they take shock (fatigue/strain/strife). If you beat it, they take wound(s). PCs, or NPCs with ruin, may take shock and make a 'soak' test to turn some or all of the wounds into shock and "80's-action-hero(ine)" your way through the gunshot wound. If you're reduced to zero wounds, NPCs are just dead, heroes get 3 toughness checks (+/- medicae assistance) to try to not die. This is probably where critical injuries may come in in the full game, but obviously not shown here. Ammo is not tracked bullet-by-bullet, but it's still a 'thing' unlike genesys. Everyone starts with 3 reloads. A standard 'complication' (a '1' on the wrath dice) is dead-man's-click and need to spend an action reloading. Alternatively you can spend a reload to add your weapon's 'salvo' value in extra attack dice (basically emptying the magazine into something). If you want to make an intimidate check versus willpower, or deception or acrobatics versus initiative, or whatever, they all have a standard effect in combat. Either the target gets Vulnerable (-1 defence for the turn) or Hindered (+1 difficulty to their checks for the turn). This means that whilst 'hitting it with my sword' is a perfectly valid choice (especially since she has a power sword), Victoria Lin can instead lower the defence of a bunch of opponents with an intimidate test and make it easy for everyone else to kill them. This is obviously akin to tearing. Since it boosts existing bonus dice rather than giving you more, it's (a) good, but (b) particularly rewards characters with the skills to get said bonus dice; meaning (rather appropriately) boltguns and chainswords give proportionately more awesome effect in the hands of elite combatants. So, what are the characters like? Everyone is a Tier 3 character or has been raised to that point, meaning all characters are in theory equal. Sergeant Harden looks a bit out of place compared to the marine and the battle sister, but she's better off than she looks at first glance because she's had two ascension packages dropped on her. Yes, a lasgun is a bit naff compared to a bolter (damage 7+1ED versus damage 10+1ED, brutal). She also has a lower soak (3 instead of 4 dice), shock 7 (the same as Orten rather than Kull or Lin) and 6 wounds not 8. However, she gets a talent allowing her to recover shock mid-battle, so her stats are deceptive, and a subskin armour augmetic, upping her resilience to nearly the same as the power-armoured brigade and the toughness 5 Lin). Her main combat benefit is her signature weapon rule, giving her a bonus damage die with her lasgun (and its bayonet), plus her BS5, which puts her far more on a par with the heavier fighters. She also has I5 and a distinctly non-standard-for-generic-grunts auspex, giving her the best awareness roll of anyone. Pater Nemoris is equally an upgraded Tier 1, meaning his base stats are...so-so. Willpower and Fellowship 5 are nice, though, as is Influence 7. He has an area-effect shock-healing ability, which is good because it's a free action and everyone for one reason or another will want to spend more shock than they have. Weapon Skill 4 Initiative 4 is okay, but Hatred Heretics gives him a flat +1 against heretics and Master-crafted on his chainsword gets him an extra +2 dice. his defence is pretty poor (although he can parry with his sword for +1), but his resilience is better than the guardsman thanks to his rosarius. Being able to spend shock to try and soak even mortal wounds is probably nice, too (not that there that looks like i'll come up too often). Aside from having too many 'y's in her name, she's....basically the bookworm. A Loremaster talent and cortical implants for knowledge tests, Peer, the Inquisitor's Influence and Symbol of authority, and the Inquisitor's Decree ability for interaction tests...you name it. However, she has the lowest resilience and wounds and joint lowest shock. However, however, she has he highest base defence (equivalent to Commissar Lin when she's using a once-per-turn sidestep), and a chainsword which is far more use for Parry than to actually stab people. Her main job in a gunfight is 'try to not get killed', but she's pretty good at it - certainly much better than a default Dark Heresy sage or scribe. Interaction attacks (intimidate, persuade, etc) give her something useful she can still do to a target not really susceptible to laspistol fire. Henna Orten is a bit more than a 'stock' battle sister but not as blinged out as the upgraded Tier 1s. Notably, her only weapon is the boltgun - she's the only character not packing a melee weapon by default. She is very good with the boltgun, though. With Ballistic Skill 5, she's a detectably better shot than the marine. Her talent ability is Marksman, reducing the penalty for called shots, meaning she can readily get bonus damage dice from a called shot. Combined with a boltgun's brutal rule, it means she's proportionally better at putting down single tough targets compared to the marine's crowd control role. Again, she's tough, meaning tanking lasbolts is (reasonably) easy. That extra point of resilience of Kull will mean a lot more than it looks like it should in practice because extra successes means one-and-a-bit bonus dice are needed but she's certainly tough enough to largely ignore the rank-and-file goons whilst she concentrates on head-shot-ing the important opponents. She gives anyone nearby benefits to corruption tests to resist chaos taint and gets a bonus to resist psychic powers. Faith is in the game, mechanically. She specifically has 'acts of faith 1' (which gives her 2 faith points and 2 acts of faith. Go figure on the numbering system). It costs 1 faith and 1 shock to use them - her shock of 7 is a touch lower than Kull or Lin, so don't use Faith lightly. Both abilities are good but pretty low-level in effect; divine guidance is +1 BS for the turn, the passion is a single out-of-turn move. Stacking Divine Guidance, Marksman, spending a clip for Salvo 2, and her base Agility 5, BS5 means she should NOT be missing, and bonus damage dice and rapid fire 2 means whoever she hits should stay the heck down. Trojon Kull is the toughest character, but @Lynata will be pleased to see he's not insanely tough. Because he's pretty much 'straight out the box' almost all his potential comes from slightly higher stats and lots of good gear. His defence of 3 is actually one of the lowest, so whilst he can tank hits well, he can't really avoid them. There is also no sign by default of the concept of Angelus-calibre weapons; Kull, Lin and Orten's bolt weapons all have identical stats of 10+1ED damage. When Primaris Marines turn up, they will probably have more powerful guns, because they explicitely are armed with bigger weapons - the Cawl-pattern Bolt Rifle is a separate thing to the Bolt Gun on the tabletop, with a physically bigger model, better armour penetration value and a longer range. He does, obviously, do insane amounts of damage with his combat knife (12+1ED), but as an unpowered blade it has no funky special traits. Rather than the 'unlimited power' of unnatural characteristics, he has a stock rule that he gets a +1 die situational modifier if the GM deems it appropriate to one of his implants (which is probably most checks other than combat attacks, frankly - most senses, raw strength, endurance for soak, you name it). The result is a rule which doesn't look that powerful but probably really is, albeit that a bonus die only has a 50% chance of coming up good. Victoria Lin is a default human Tier 3 character. Her resilience is (unsurprisingly) lower, since her armour is just a flak greatcoat. She's much more a 'don't get hit in the first place' combatant. Her power sword does fractionally less damage than Kull's combat blade once strength bonus is baked in (11+1ED versus 12+1ED) but it has parry, increasing her defence in melee. She also has Sidestep, which lets her further increase her defence against 1 melee attack per turn. Her biggest skill is intimidate. With Initimidation 4, Willpower 5, her commissar abilities giving her a flat +1 to intimidate score and the ability to intimidate mobs without penalty, she can apply vulnerable to big mobs without much trouble, allowing the other PCs to clean up. She's also another character who boosts friendly resolve checks, along with Pater Nemoris. Great write-up! Have you considered posting this to /r/40krpg? Overall, I really like what I've seen of the rules so far. They're not quite as drastically streamlined as I in my newfound love for rules-lite would have it, but they look like they'd really speed up the game by removing that dreaded need for page-flipping, and introduce some interesting elements in regards to how they make bonuses work. Nitpick: I believe both versions of power armour offer the same base protection (+6), in line with GW's own rules and codex fluff. It's just that Kull has an "adjusted" Toughness of 5, which increases his total Resilience by 1 over Orten's. Too bad these Adjustments aren't really explained, but I take it to mean they refer either to the Archetype (see the Space Marine's +4 Strength) and/or chosen Attribute levelups from Ascension (the Commissar as the only other Tier 3 character has no Adjustments at all)? Wild guess. But, I really like the general idea of how location damage and called shots were simplified -- although personally, I think it would've been better to resolve that via bonus effects rather than general success. Just because you miss the lenses doesn't mean you don't hit the head, if you get my meaning. I also think the Marine's balancing was cleverly done, in that he's tanky but also easier to hit, and that the Astartes archetype's combat bonus focuses on crowd control. It allows Space Marine players to do all the stuff that is firmly connected with the fantasy (chopping through hordes of enemies and shrugging off minor hits), whilst at the same time still leaving enough room for other combat-focused characters to excel elsewhere. The whole Faith system also reads almost as if someone was reading my ramblings that I've spammed onto these forums for like five years now. Ross, is that you? Pretty much the only thing that feels a bit weird about both the Sister and the Priest is their AoE buff, in that its benefit seems to be applied very loosely to any ally. Given how these effects are (presumably) based on being inspired by religious idols putting on a show, you'd think it should at least require the benefiting character being a believer (e.g. something like at least sharing the "Imperium" Keyword), but as it stands this will apparently apply even to unbelievers/heretics/xenos? I guess it's just one of those things that we're supposed to swallow for the sake of the game (in that it might be "unfair" if some characters were left out due to their background). Either way, all in all I'm actually pretty hyped for this game by now. It keeps looking better with every bit of info they release. Just because you miss the lenses doesn't mean you don't hit the head, if you get my meaning. That's a problem with called shots in pretty much every game system I've seen; but if the 'payback' is a better hit, there needs to be a 'cost', and it seems the universally accepted cost is making the 'to hit' roll harder. Personally I agree; if I'm aiming for the joint between the chestpiece and 'gut protection' in power armour, and miss a bit, I should, logically, still hit you. But that's one thing I like about stuff like about systems like Genesys and L5R where you can spend opportunities or bonus successes from 'over-hitting' to retroactively strike a weak point, or whatever, because clearly the narrative meaning of rolling 1,000,000 successes on your to hit roll is 'boom, headshot'. That's why I was trying to compare them the most. As noted, we don't know exactly how their 'base' strength/toughness/agility/whatever translates into the more derived stats like defence/resilience/shock and so on, beyond "they're presumably connected", but the fact that a 'stock' tier 3 human can match a 'stock' tier 3 marine in numerical stats, even if the marine's gear and special rules then pushes the marine ahead in the areas he should be better, feels right. You can be a better swordsman than a marine (Caine, Gaunt, Eisenhorn, and Draco all beat traitor marines blade-to-blade. Heck, Dinas Chayde beats a primarch*). Much like Black Crusade, the intent is to allow you to mix and match human and astartes characters, so the game needs to allow characters of the same level to match one another's base abilities. It's much like my view on Angelus calibre bolters; I have no problem with them existing; a marine is bigger and stronger than a human so giving them a more powerful version of the weapon makes a certain amount of sense. But given that (especially in black crusade) it is perfectly possible for a non-astartes character to match or exceed a space marine's strength and ballistic skill, unnatural characteristics included, making these weapons somehow never ever useable by a normal human whatever you do is silly. Quite possibly. Light powered armour isn't something that is in the tabletop, but that's because there is no 'gap' between a 4+ and 3+ save - equally there's no difference between aquilla, corvus and iron patterns of power armour, despite GW emphatically stating that the latter is more heavily armoured and the second more lightly armoured than the first, because rules for a "3 1/2+" save is more trouble than it's worth. An RPG potentially does go into that level of detail (and even when Dark Heresy was a GW/Black Library product, Light powered armour was still a thing), the base game doesn't. Personally, I don't mind either way. As I say, the main thing to wait and see is the mechanic for 'recovering' faith points. I understand the dislike of 'talents powered by fate points' because it runs you out of fate points, meaning you can't use them for their normal function. I didn't mind the DH2.0 faith system - that always struck me as fairly elegant - because that also gave you the means to quickly recover those fate points (meaning you weren't short relative to other players, and if anything got 'luck going your way' more because you could afford to spend more on rerolls), plus it subtly encouraged you to use bolter and chain weaponry, which was rather appropriate for a battle sister character, even if detached to the Inquisition. Pater Nemoris' ability, fiery invective, specifically does call up the Imperium keyword. Victoria Lin's and Henna Orten's don't but the former works on 'anyone you can glare menacingly at' (her 'relationship with other characters' mentions her considering what to do if she decides she has to try and execute the white scar....) whilst the latter is essentially acting as anti-warp-corruption-buffer; I think it's meant to reflect daemons and witches going 'aaargh, someone pure of faith, my powers are not working!' rather than necessarily her allies being inspired. * Okay, 'lands a hit' and lodges the sword in the primarch. Which, whilst being obviously painful and serious, doesn't inconvenience said primarch enough to stop him then splitting the guy in two. But nevertheless 'would have beaten a primarch in a duel to first blood' is a pretty impressive level of skill to have on your resume. Exactly! That's what I was getting at when mentioning bonuses -- you can already shift Exalted Icons into damage, so the explanations from Called Shots would have been perfect for tying this together. Not that this is too big a deal, just feels like a wasted opportunity. Much like Black Crusade, the intent is to allow you to mix and match human and astartes characters, so the game needs to allow characters of the same level to match one another's base abilities. I still think BC kinda failed at that, at least when it comes to human combat characters vs Astartes. Those alternate Horde rules just were additional evidence -- when the studio suggests using different mechanics for different "races", you know something is up. By contrast, just making similar guns available to everyone already means a lot for W&G. It's much like my view on Angelus calibre bolters; I have no problem with them existing; a marine is bigger and stronger than a human so giving them a more powerful version of the weapon makes a certain amount of sense﻿. For me it was admittedly mostly a "matter of pride", as the (newly introduced!) idea of an Angelus-calibre always felt very tacked on, as if Space Marines weren't powerful enough already, so I would have protested even a minor bonus. But (post-PtU) DH & Co just made it silly by giving Marines smaller and lighter boltguns that did more damage than the larger and heavier heavy bolters humans apparently had no problem lugging around, in addition to the "race-lock" you mentioned. ? An RPG potentially does go into that level of detail (and even when Dark Heresy was a GW/Black Library product, Light powered armour was still a thing), the base game doesn't. There also was no difference in GW's Inquisitor game, and that one was d100-based with larger gaps as well. Personally, I never took SoB armour to be "light" in the first place, or at least not light as in = more lightly armoured, mostly because equal protection was specifically called out in the original sources. What would have also made sense, however, would've been to stat light power armour as simply not fielding as many auxiliary systems (just like "light infantry" doesn't mean more lightly armoured than "heavy infantry", but generally suggests lighter armaments or less equipment for the sake of mobility). Most of the Marine armour's bulk does not come from its plating, but from the many additional subsystems it has over other powered suits, which is the one thing the SoB armour has always been said to be lacking in comparison. That would also allow maintaining a bit of a gap between powered and non-powered armour, as otherwise the DR increments will only come in steps of +1: flak already starts at 3, and with power armour at 6, and there also still being carapace (presumably at 4), there's not a whole lot of wiggle room (only 5) left for light power armour to fit in. I could perfectly picture W&G to not have any light PA to begin with. I don't think I would miss it; was it ever a thing in codex fluff or even the novels? That's true, the Recovery system was quite good. It's really just that it still felt awkward to have two narratively distinct systems share the same resource. W&G is *kinda* similar in that using Faith also requires Shock, but this makes a whole lot more sense to me as I've always understood Acts of Faith to be a "mind over matter"/zen kinda deal, as in using willpower to unlock the full potential of your body and temporarily boost yourself, at the expense of draining yourself faster. It goes perfect with the whole "candle that burns twice as bright lasts half as long" schpiel of religious zealotry in 40k. I think it's meant to reflect daemons and witches going 'aaargh, someone pure of faith, my powers are not working!' rather than necessarily her allies being inspired. Hmm, it's an interesting interpretation, though it still sounds a bit like pushing the Sister a bit into psyker territory. But that's mostly because I've grown to see Faith mostly as a very "zero range" kinda thing, as lack of psychic ability would mean you couldn't push the area of your will's effect further out. On the other hand, I already mulled over the possibility of Faith-based stuff like exorcisms having a ranged effect on daemonic beings, on the basis that it's the daemon who makes the connection rather than the Faith-user, so I guess I could see where you're coming from... I might be able to work with this angle! I also didn't notice the Priest's requirement, so thanks for pointing that out. That actually fits nicely to the above, as it hints at W&G not following BoM's idea of Faith being space magic. Hmm, it's an interesting interpretation, though it still sounds a bit like pushing the Sister a bit into psyker territory. Not really; I see it as no different to a Vampire running away from a priest with a crucifix. The priest isn't a wizard, it's just that the magic holding the vampire together doesn't work well in the presence of faith. To me it's a bit of a sliding scale. At one end, you've got battle sisters who have 'that's lucky' shots where they strike the weak points of armour far more often than their marksmanship scores would suggest, or just refuse to die despite grotesque injuries. At the other, even in Codex: Witch-hunters era, you have emphatically got pretty much active divine intervention in the scale of stuff like Saint Golden-Armour-Flaming-Blade-Flying-On-A-Column-Of-Light-Surrounded-By-Doves-with-Malefic-Sorcery-Splashing-Harmlessly-Aside Celestine. Not every Adepta Sororitas has to be (or should be) a walking 'tactical miracle dispenser', but the same system has to be able, at its top end, to cope with the handful of individuals who are. I think it's part of giving lower level characters a leg up against bigger opponents. 'Shifting Forwards' an exalted icon is fine, but only 1/6 of your dice, and 1/2 of you icons will come up able to do that. The problem is that a lot of tougher opponents are functionally immune to las-fire, and if you can't reliably get at least one bonus damage die, you're essentially wasting your time, and few players I know enjoy rolling dice simply for the sake of rolling them. The called shots rule allows you to reliably trade 2 successes for an extra damage die, which is the same as giving up an exalted icon, but (a) it's guaranteed, and (b) you can do it as well as getting a lucky extra exalted icon. Ultimately, I'm not entirely sure why they felt the need to do a separate damage roll, which is what causes the problem in the first place. Removing the damage roll in favour of a flat damage bonus and 'extra successes' is one of the most elegant bits of genesys/L5r, because it means that a sufficiently gifted samurai can, in theory, take down a troll with a fruit peeler, without resorting to 2,437 special rules and talents to boost this, ignore that, or reroll the other. I still think BC kinda failed at that, at least when it comes to human combat characters vs Astartes. Those alternate Horde rules just were additional evidence -- when the studio suggests using different mechanics for different "races", you know something is up. As someone who's GM-ed Black Crusade a lot, I can assure you that those rules were only needed if the non-combatant humans (Like the Apostate or Plaguemeister) ended up in on the field along with marines (which is poor judgement on the PCs part along the lines of a Rogue Trader's laspistol-wielding seneschal deciding to drop into a warzone instead of sending in a battalion of house guard) . The human combat archetypes were perfectly capable of keeping pace with marines, either against one another or against hordes. Indeed, our group's 'point woman' was a Xurunth Frost Father who tended to go through hordes like a mulcher through a half-dead Christmas tree. But (post-PtU) DH & Co just made it silly by giving Marines smaller and lighter boltguns that did more damage than the larger and heavier heavy bolters humans apparently had no problem lugging around, in addition to the "race-lock" you mentioned. ? That was silly. I know we disagree on the rifle version - you have issues with the Angelus, and I don't, but whilst I have no problem with the bigger, stronger marines carrying a sort of hand-and-half version of the regular boltgun, the heavy bolter should have been the same weapon; the 'mundane' version, after all, is a crew-served, emplaced weapon - it's size and recoil are almost irrelevant to the guardsmen manning it. The priest isn't a wizard, it's just that the magic holding the vampire together doesn't work well in the presence of faith. Yeah, that's what I was getting at. What makes daemons manifest in realspace in the first place is a localized "emotional current" which even normal people give off, and the Warp came before the first psyker. Thus I could see daemons recoiling before someone passively countering them with faith, as opposed to a psyker actively fighting them with the power of the Warp. In fact, Battle Sisters in GW's Inquisitor game had one ability exactly like that (= stun daemon for 1d3 turns), and it was explicitly described as non-psychic in origin. At the other, even in Codex: Witch-hunters era, you have emphatically got pretty much active divine intervention in the scale of stuff like Saint Golden-Armour-Flaming-Blade-Flying-On-A-Column-Of-Light-Surrounded-By-Doves-with-Malefic-Sorcery-Splashing-Harmlessly-Aside Celestine. At least in Games Workshop material, Celestine was very much a one-off exception, though. I know a lot of fans think that every Living Saint looks and fights like her (considering the fanmade Saints I see, or even St. Anais from DoW:Soulstorm), but from what we were told in codex fluff, the other Living Saints were much tamer and may well have been ordinary people who just lived long enough to become famous warriors of faith, like Dominica's inner circle. And even then, Celestine's pre-8E rules and fluff had left it very ambiguous as to whether she was a true miracle or an elaborate archaeotech scam. Did you notice her Invul save is actually a result of her armour, rather than an innate ability? Of course, the new writers in 8E have now made it clear she's unnatural, though. Not that I have a huge problem with that; I already leaned heavily towards an interpretation where she is effectively a benign Warpspawn, conjured forth by the collective emotions of the crusading army in whose midst "she" materialized. Still, I hope no W&G player character will ever acquire Celestine-levels of space magic. I prefer Acts of Faith as they were explained in the codices - "miraculous to the uninitiated" - and I'm happy to see that, so far, the rules seem to be compatible with my personal preferences of at least leaving it ambiguous. On that note, I wonder whether Tech-Priests will still have "tech magic" like in Dark Heresy, or if the new game will go for a more toned down version of how the Mechanicus operates as well? I think it's part of giving lower level characters a leg up against bigger opponents. Probably, but will those characters be able to amass as many dice to succeed at +2 DN per step? The chance to roll a 6 with two dice for guaranteed bonus damage isn't that much worse, compared to 4-6 on two dice for maybe doing damage at all. Ultimately, I'm not entirely sure why they felt the need to do a separate damage roll, which is what causes the problem in the first place. Amen to that. A gun or a sword that will hit the same space with the same amount of force 100% of the time should do the same damage 100% of the time, which means it should all rely on the Attack. Oh well, can't have everything. And you just made me remember I really want to play some L5R sometime. The human combat archetypes were perfectly capable of keeping pace with marines, either against one another or against hordes. Without the optional Horde rules, and in spite of the difference in weapon power and resilience? The gap is not insignificant, after all. the heavy bolter should have been the same weapon; the 'mundane' version, after all, is a crew-served, emplaced weapon - it's size and recoil are almost irrelevant to the guardsmen manning it. And then we have some few (unenhanced) humans like Sgt. 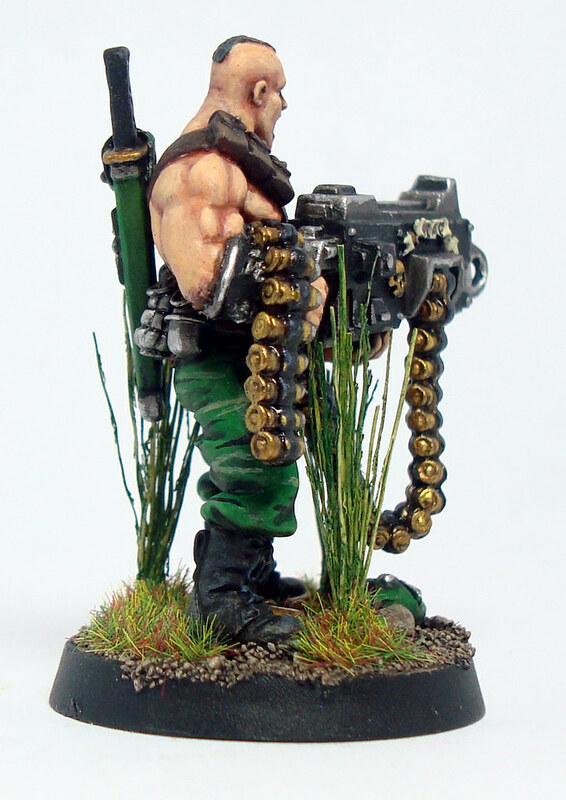 Harker who can handle said heavy bolter "like other men handle a rifle" (Bulging Biceps ftw?). Which makes me think that lesser men than Sgt. Harker should have no problem handling a standard Marine boltgun, aside from the grip, either. Games Workshop never intended for there to be a significant difference, which keeps peeking through in the tabletop material -- so it always felt weird to me that DH & Co, as well as some few Black Library novels, went a different way. Perhaps because their authors and editors weren't quite aware of this studio material, and were also just going off the idea that Marines = bigger = more dmg? However, just like with Marine power armour, there are different ways to explain a even a ~18% increase in bulk, especially as we have (admittedly Rogue Trader-era) fluff showing us a cross-section of an Astartes bolter featuring a plethora of subsystems like "auto-repair circuits" or palm ID readers. By the way, what about that reddit post? I really think you ought to spread your analysis; I'm sure more people would love to read it. Many thanks for the review, @Magnus Grendel! Perhaps because their authors and editors weren't quite aware of this studio material, and were also just going off the idea that Marines = bigger = more dmg? Yup. You do need to fight smarter, but that's not the same as being ineffectual. For example; you can't parry a horde's attacks. But you still apply the penalty from defensive stance, and most opponents who make up horde members are in serious trouble at -20 WS - hordes get a damage bonus but not a to-hit bonus. There's a mundane human tower shield in the tome of blood (I believe it's one of the Kursian gladiator weapons) which lets you do defensive stance and still attack. And weapon power isn't too big a deal, either, because once you've got enough damage potential to wound a horde member without needing to roll dice, the hit is automatic magnitude damage. A renegade with a power maul and adroit (weaponskill) will cut through a horde's magnitude far, far faster than a space chosen with a legion chainsword. It's why in a mixed ascension/deathwatch game we played, the party's attached battle sister was designated crowd control expert; A 'mundane' 1D10+5 Pen 4 bolt shell is just as lethal to a scrotty dude with a rusty lasgun and an eightpoint star tattoo as an 'angelus 1D10+9 Pen 5 round, and a godwyn-de'as pattern storm bolter, thanks to its reliable and storm qualities, can pump them out at nearly three times the rate of fire without jamming every ten bursts. With the tabletop game recently (re) introducing electro-priests and the canticles of the omnissiah to provide stuff like Shroudpsalm to give 'instant cover' from digital static, don't hold your breath. And you just made me remember I really want to play some L5R sometime. Yes. It's an awesome rules-set, once you get your head around the approachs system. The Mass Combat bit of the beta needs tweaking in the final version, but most of the other problems were addressed in the beta updates. Hardly. Many of the core black library authors I see people say this about are the original GW codex authors; Graham McNeil and Gav Thorpe are cases in point. I shall have to have a look when I get a chance. Thanks. In my current DW game Callidus assassin attached to Kill-team is their main Elite&Master-level enemies killer. When hordes of hormagaunts are rushing towards you - it's Astartes work, but when you are attacked by 8 genestealers in a narrow tunnel - this is assasin's finest hour. Well, the Stechkin has a longer barrel, but - assuming that the difference really is that noticeable (what's it in detail? ), and accounts for the difference in DH etc - that would also necessitate a much more noticeable difference between boltguns vs bolt pistols in general, compared to "civilian" boltgun vs Astartes boltgun, or "civilian" bolt pistol vs Astartes bolt pistol. Furthermore, unlike conventional firearms, bolt weapons were, at least in codex fluff, described as having a two-stage firing mechanism where most of the kinetic punch comes from the miniature missile that activates after the projectile has cleared the barrel. Gotta say, though, I prefer it the other way around in W&G, with the Space Marine being the CC expert, and other combat experts potentially excelling at single-target damage. It just seems like a more appropriate role distribution, but I realize this is mostly a response based on gut-feeling. Plus, in BC, isn't it still an advantage of questionable balancing that the average Marine can do both, even when a dedicated combat expert can keep up in one area? Aw, shame. Well, I'm sure there's also people who are happy with this interpretation. Sure, but were they actually among the few that wrote books that featured such differences? Gav also did Inquisitor, and there the guns were explicitly the same. As was the armour. I would say that a well handled disciple of chaos can beat a marine down pretty effectively in their area of competence (basically pick one each of ranged/melee and crowd control/assassin), but the flexibility of astartes stats and gear means a marine will outclass them in the other three. Whether that's balanced enough is an issue of tactics and gm-controlled encounters. Purging of kaddilus and warriors of ultramar both include ' astartes-power' boltguns. If youve not had a chance to try L5R, I think its a very good ruleset. It's very flexible and well suited for the setting. Huh, TIL! I suppose it's not that surprising that individual authors may harbor interpretations that differ from "studio consensus" (ADB once explained it nicely concerning his work on the Horus Heresy novels), but I always expected Gav to be somewhat "representative". I'd certainly be interested, really depends mostly on finding a play-by-post that's still looking for players. I happen to have three concepts for L5R still lying around that I never got to play. They're from the previous edition, but easy enough to convert; in fact I already did it for one just to try chargen. That said, most online groups tend to play "live", and that's something I very likely cannot afford to commit to right now due to work (especially over the next few weeks) + timezone differences. ? That said, most online groups tend to play "live", and that's something I very likely cannot afford to commit to right now due to work (especially over the next few weeks) + timezone differences. Indeed. I've got a decent group of players locally, who've had a standard 'game night' for several years, and I know I'm lucky for that. Finding time for games is not easy. 30 m/s of muzzle velocity and better ballistic coefficient. While nominal muzzle energy is only 16% more, taking BC into accaunt this lead to the fact that PM is just a sidearm, while APS is a weapon in its own right, up to date in use by special law enforcement teams in situations when compact automatic rifle or SMG is too bulky. About bolters I have a conversation with my players some time ago. I prefer to use RAW with minimum houserules, so in the DW game I needed to logically explain the difference between "astartes" and "civilian" bolt weapon, and I think that I found a good compromise. Maybe I'll try to translate this conversation to English but not earlier than on weekends - it will take a lot of time. Isn't the increase in muzzle velocity 8% (315 to 340 m/sec)? But regardless, of course it makes sense to go for the best regardless of the actual increase, unless other factors are more important. It's why I'd argue Space Marines are a thing without necessarily having to be literal gods of war. Perhaps said law enforcement teams would prefer the new version of the Makarov to the APS if its 430 m/sec PMM rounds had entered serial production. Unless they might have been compatible with the APS, too? Maybe I'll try to translate this conversation to English but not earlier than on weekends - it will take a lot of time. Well, that sounds like a lot of work, which you shouldn't really have to do just for a discussion like this. Can't you summarize it in one or two sentences or a few bulletpoints? But it's actually not very hard to explain a difference between Astartes and "civilian" weapons at all -- the problem is that any explanation requires ignoring one or more details about how said weapons were said to work in previous sources. As such, this is mostly a matter of interpretation and what we like to base our perception of the setting on. In the words of Aaron Dembski-Bowden: "there is no canon". So if I disregard codex fluff, I'd just go ahead and say Marine weapons shoot bigger slugs, just like MG suggested. Another possibility would be projectiles that may have the same caliber but a massively increased length. Or maybe their bolts are just made of better materials than anyone elses, even the Inquisition. Also, maybe we should make a new thread for this, I kinda feel bad for spamming up MG's Wrath & Glory thread with this stuff. E(kinetic)=m*v^2/2. 8% in speed = 16% in enegry. So if I disregard codex fluff, I'd just go ahead and say Marine weapons shoot bigger slugs, just like MG suggested. Another possibility would be projectiles that may have the same caliber but a massively increased length. I found a variant in wich I can use the same ammo in all bolters (heavy bolters use larger caliber, but "civilan" and "astartes" heavy bolts are the same), but explain different damage value of DH and DW bolt weapon. Now I think about a resume of some sort, but not sure that it will be easier than full translation. I found a variant in wich I can use the same ammo in all bolters (heavy bolters use larger caliber, but "civilan" and "astartes" heavy bolts are the same), but explain different damage value of DH and DW bolt weapon. Hmm, as if the weapon itself would convey some sort of damage boost? What prevents its application to "civilian" bolters? Weight and size. "Civilian" boltgun weights 7 kg (by IH), "astartes" - 18 kg (and don't ask my why Stalker boltgun weights 1 kg less than standard). More weight = less recoil, add power armor to the equation, and Astartes can shoot more precisely. More weight = more barrel length, more muzzle speed, better ballistic coefficient. Already we have some advantages of "astartes" bolters used by Astartes, all of them are not in terms of ammunition, but in the final damage. Two-stage machanism? There is an explanation. With lower muzzle speed "civilian" bolts mostly detonate at the surface of the target or "just some millimeters inside", while "astartes" bolts can have enough energy to detonate in the middle of the human-sized target. Hydrodynamic shock inside living body is a very serious thing. PMM ammo isn't compatible with old pistols, and PMM pistol don't have full auto mode. In theory we have a lot of new weapon... On practice.. it's different thing. More weight = more barrel length, more muzzle speed, better ballistic coefficient. Already we have some advantages of "astartes" bolters used by Astartes, all of them are not in terms of ammunition, but in the final damage. So you would give an Astartes bolt pistol less damage than a "civilian" boltgun? Also, keep in mind that accuracy has no effect on potential maximum damage -- any two guns can hit the same spot. Arguing from this angle, all weapons should rather have a Strength requirement, which in turn should modify the BS Test, with DoS "spilling over" into a damage bonus. Then you'd have realism. Of course, any explanation would always require ignoring at least one bit of codex fluff, which happens to specifically call out parity. If I'll create full houserule table - yes, but in "maximum RAW, minimum houserules" situation quality of Astartes weapon and additional benefits of Astartes power armor justify my decision of RAW damage (IMHO, of course). I'm sorry, but you are very wrong. If I'll need to kill a human with one shot from the pistol at 50 m - I'll not take PM, or APS, or any other police or military pistol - I'll take sports 5.6 LR "Margolin" because with it I can choose what eye to hit - left or right. And it's not about my Strength or Ballistic Skill - it's mainly about weapon accuracy. Well, I for one consider it quite silly - but also telling - that in RAW, a lighter, shorter, smaller-caliber Astartes boltgun still does more damage than a heavier, longer, larger-caliber "civilian" heavy bolter. And of course the same crazy difference holds true for non-projectile weapons like flamethrowers, plasma weapons and meltas, too. But, things are as they are here, and I've nagged on enough about it. I'm just glad that Wrath & Glory will be closer to what I'm used from the codices and GW's rules, though this is of course just a matter of personal preferences. And it's not about my Strength or Ballistic Skill - it's mainly about weapon accuracy. You still won't have a 100% hit chance, just like any other gun can still hit said eye by pure chance. As such, maximum damage has to be independent of accuracy. It's just physics. I'm sorry, too, but if two of the exact same projectile, fired from two different weapons, hit the exact same spot .. it makes zero sense for one to somehow do less damage just based on how accurate the weapon might be. Besides which, gun accuracy is but one factor that determines impact zone. With moving targets in particular, pure chance plays a big role, too, as does the shooter's experience. Not all is perfect in our not-so-perfect world ? I'm sorry, too, but if two of the exact same projectile, fired from two different weapons, hit the exact same spot .. it makes zero sense for one to somehow do less damage just based on how accurate the weapon might be.﻿ Besides which, gun accuracy is but one factor that determines impact zone. With moving targets in particular, pure chance plays a big role, too, as does the shooter's experience. And this is why I was sure that translation would take a long time and and ersatz-version would be clumsy.. Accuracy is just one of the factors. Damage of the weapon in the game is the combination of many factors. AFAIR, once I already told you that the only way to ideally imitate real life shooting in the RPG game is to take real guns and shoot. Okay - just as a head-up, DrivethruRPG has a haloween sale, in which Wrath and Glory is included. I've taken the option, and had a chance to look at the full rulebook now - hence the change of thread title. Obviously the basic rules are unchanged. As with a lot of 'taster' adventure, critical hits are simplified, but a critical table (which is very '40krpg' in nature, with detonating ammo, extremity removal, and "ragged remnants of their body strewn across the battleﬁeld") has been added. More significantly, criticals are triggered off a '6' on the wrath die and always do a minimum of 1 wound, much like later versions of righteous fury. That means that you always have a 1/6 chance of causing a wound, even with a stubber aimed at a space marine. Obviously they can then potentially 'soak' the wound and make it go away, but that's a check which they have the potential to fail - wounding a terminator armoured veteran with a laspistol is unlikely but it is always theoretically possible. Possible complications (from a 1 on the wrath die) are similarly bulked out - there's a table including 'out of ammo', 'dropped weapon', 'weapon jammed', etc. Amusingly, one automatic complication from using an unbraced heavy weapon (unless you ignore it for power armour, talents, or being an ork) is being knocked prone in addition to any other ineptitudes. More combat actions - stuff like suppressing fire - have been added. Vehicle Combat and - surprisingly - Voidship combat are in the core book too. Interaction attacks (the intimidate stuff above) is still a thing, but obviously with different skill - so now in voidship combat, a Tech interaction attack would represent jamming. One nice requirement is that to use a tech interaction attack, you must share a keyword - so an Adeptus Mechanicus character would have difficulty tech-ifying an attacking eldar corsair ship (as he or she should). Voidship combat ranges are a bit short - movement and weapon ranges are in kilometres, so an imperial frigate's macrocannons have only a 4km range compared to a 3km per turn minimum move..
Human, Adeptus Astartes, Eldar and Ork characters are in the core book. Marines pick a chapter and get two bonus rules - or are primaris (at a higher starting tier) and get even better stats and ignore any geneseed-based negatives from their chapter rules. Inquisitorial characters pick an Ordo with a bonus. Sororitas <order>, Mechanicus <forgeworld>, Aeldari <craftworld> are for you to choose, but are basically just a narrative choice and only matter for rules where you do (or don't) have a keyword - they don't provide a bonus by themselves. Scum have the <any> keyword - essentially you're encouraged to insert a keyword for a hive world, a gang, or whatever your character would most identify themselves as. You're even allowed to pick a <regiment> (for a militarum deserter) or <chapter> (for a former chapter serf), although without the special rules. Infernal and Aeldari psychic powers are in the book. Once again, a bolter is a bolter is a bolter, so rules-wise there is no distinction between a Godwyn, Godywn-De'az and Mars patter weapon. A Cawl-pattern Bolt Rifle (what primaris carry) is a fundamentally different weapon but it still has the same damage and rate of fire (salvo score) - it's advantage over the bolter are its AP (it's better at killing armoured opponents) and range (60m instead of 40m, and - critically - 30m instead of 20m for the 'half range' Rapid Fire boost to damage). It's still not quite as good as a heavy bolter, even in rapid fire range. Duelling Laspistols are essentially bolt pistols - but without brutal or salvo, for inquisitors or rogue traders with a touch of class. Salvo 6 of an assault cannon is appropriately terrifying, adding about the same number of dice again to your roll to hit that you'd expect from a competent soldier's aimed fire from sheer weight of bullets.... If you're prepared to empty the magazine, then essentially it's "remember this [****] at christmas" from the Expendables all over again. Skitarii-style weapon (arc weaponry, radium weaponry) is in there for mechanicus characters with a steampunk stormtrooper bent, as is a basic smattering of eldar and orkish weapons. There's a good but not ridiculous melee weapon selection and a fair number of weapon mods. You can pretty much glance through any 40k core book to guess the sort of thing. Noticably Master-Crafted (or 'Kustom' if you're an ork) is now a standard upgrade that you have or (more likely) don't - there's no 'craftsmanship' as per dark heresy. Light powered armour is still a thing, but sororitas powered armour isn't light. Aquila powered armour has only the same protection (5) but does grant a better strength boost powered (3). Terminator (and Mega) armour is protection (7) with powered (5) - (4) for orky stuff. The great rift runs from the eye of terror to the hadex anomaly. So, assuming hadex hasn't swallowed the entire reach, Jericho and Calixis are now critical bits of the imperium, as they're imperial holdings at the 'ends' of the rift, and essentially form the 'capetown' ports through which any traffic going round, instead of through the rift has to pass. Not really looked at the map before. Yeah.... Imperium Sanctus is all well and good, but Imperium Nihilus is cut off from the Astronomican, Mars, Ophelia, Fenris, Nocturne, Rynn's World, The Rock, Armageddon and Macragge. Valhalla, Mordia and Atilla are all on the far side, but Baal is the only 'big name' world on the map on the far side. I actually got the book already, so most of this is not news to me. However, there is one thing that you didn't quite get right. The Tier 4 Sororitas would not necessarily have two ascension packages. The game does not intend for the tiers to be risen through in a single campaign - they are separate levels of play, much like the different game lines were previously. You're therefore not supposed to play until rank 5 in one tier and then ascend to the next one - though you can! Ascension packages are meant to allow you to play a lower-tier archetype in a higher-tier campaign. Say you want an IG General in your T4 campaign, you could take a Guardsman, Stay The Course and voilà, T4-compatible guardsman. Or have them awaken as a Psyker with the other ascension package. In both cases, you only take a single ascension package, even though you jump up 3 Tiers! The exception is the Scout Marine, who gets to become a proper Marine.